In April 1978, the first ever Rock Against Racism/Anti Nazi League Carnival was staged in Victoria Park, London. The final line-up included The Clash, Steel Pulse, Tom Robinson Band and X-Ray Spex. 80,000 people attended, with 2,500 travelling from Greater Manchester in 50 coaches and minibuses. Geoff Brown (Anti Nazi League) co-ordinated the coaches with help from organisations such as Manchester Polytechnic Students’ Union. This Geoff's list of where all the coaches would be picking up. 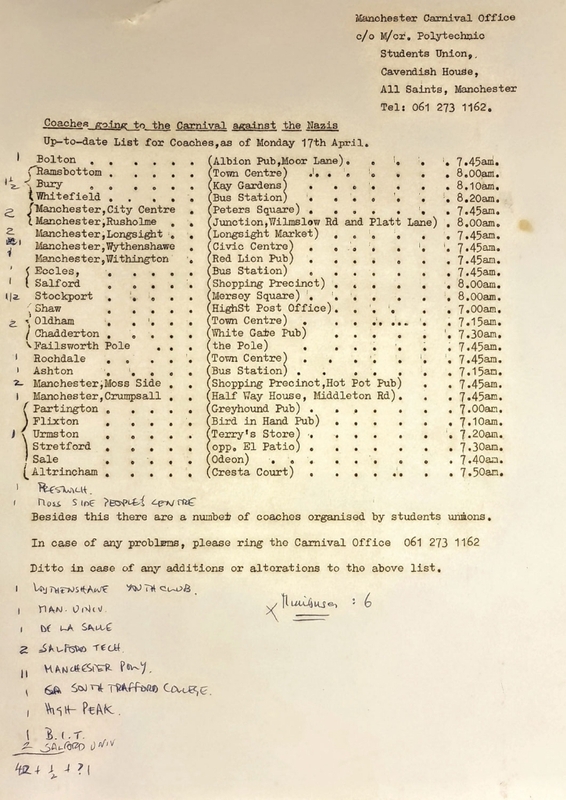 It was on the train home from the Carnival in London that Geoff Brown and Bernie Wilcox, who had already been promoting small RAR gigs across Manchester, decided that together they would organise the Northern Carnival Against the Nazis.